What is the Best Mouse Poison UK? Mouse poisons are often brightly coloured. Pictured are grains. The best mouse poison is dependent on whether there is the opportunity for contamination with non-target animals and children and whether you are targeting a mouse or a rat. The active ingredient alphachloralose is always preferred with mice, while if you have rats difenacoum is preferred when non-target species are present, but brodifacoum is preferred when they aren’t. These ingredients are used to produce three types of baits: blocks, grains and paste satchels. The first is preferred in areas with non-target species as it is easily secured. What are the active ingredients and which should I use? *Although Difenacoum is recommended where non-target animals are present, it is still a potent poison to mammal species. Therefore, it is vital that baits are protected from ingestion by non-target species. If you find a non-target animal has ingested the poison, seek medical advice from a vet immediately. When compared to other multi-feed anticoagulant rodenticides, difenacoum has a good level of activity against the brown rat, and excellent levels of activity against mice. In comparison bromadiolone has a good level of activity against the brown rat, but only moderate levels of activity against mice. For this reason difenacoum was chosen as the active within the RACAN ‘HOME FRIENDLY’ range. This range will bring both rat and mice infestations under control, but due to the strength of the active this will take time, as the rodents will need to feed on several occasions to build up the level of active within their bloodstream to a lethal dose. Many customers will feel happier using this active as it is considered less of a danger to non-target species. It is also the best active for use in block baits as single feed baits in this formulation would offer a high risk to non-targets. Extremely toxic to all mammals and therefore is essential that it is kept locked away from non-target animals. Bait boxes are strongly advised. With the restrictive changes brought in on active concentration, we thought it was sensible to give amateurs the opportunity to use single feed baits if they wish. Brodifacoum offers an excellent level of activity against the brown rat, being a significantly stronger anticoagulant active than difenacoum. This therefore is the active of choice in our single-feed anticoagulant RACAN ‘FORCE’ range. A rat will reach a lethal dose from one standard feed of this poison and so the results are seen very quickly. It is essential that all baits are well protected from non-target animals and the best way to achieve this is by placing the baits in an approved bait box. 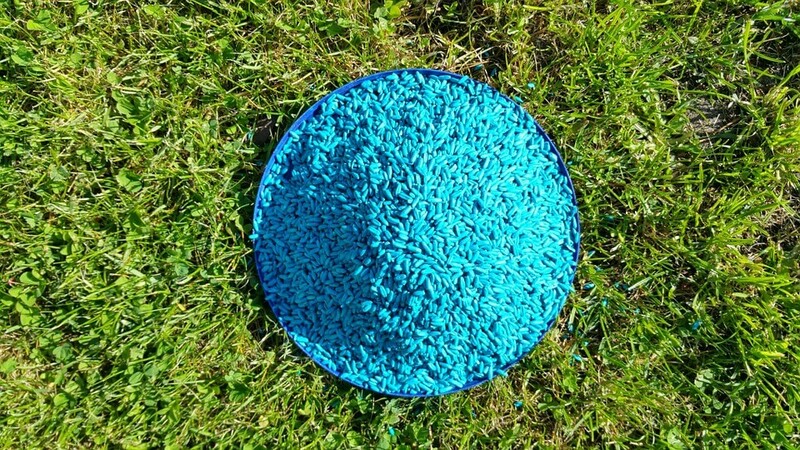 Within the RACAN ‘Rapid’ range we use alphachloralose which is part of the narcotic family and the most powerful mouse poison on the market. It is not affected by the new legislations as this only applies to anticoagulants. It is proven to kill mice within minutes with one bite of the product. It works by decreasing the mouse’s body temperature and sending it into a coma which it does not awake from. The active dissolves in the bloodstream and so (unlike anticoagulants) it has minimal secondary toxicity issues to non-target species. It is the speed of the onset of the active that makes it unsuitable for rats, as they feel the effect before they reach a lethal dose and therefore stop feeding. RACAN RAPID is a mouse only poison. Unfortunately, other chemical controls such as zinc phosphide, calciferol and bromethalin are banned in the UK under EU law. Should I use multi feed or single feed baits? Multi feed baits cause the target species to gradually become sick over time. This can lead to the rat or mouse becoming disoriented and often will lead to them dying in an unreachable area such as under floorboards; this has obvious implications for hygiene. Multi feed baits will by their nature take longer to work due to the requirement of the target species to return and feed numerous times before reaching a lethal dose. Difenacoum a multi feed bait does have advantages however (as mentioned above) with non-target species. This is safer to use in areas where domestic pets or farm animals have access, but again should still be handled carefully and kept strictly contained and away from where non-target animals might ingest. Mice and rats are best distinguished by the size of their droppings. Mice droppings are less than 0.75cm, while rats are significantly larger. You’re are much more likely to hear rats than you are mice and are very unlikely to hear mice crawling. Which active ingredient is best? If you have mice only, alphachloralose is a no brainer. Brodifacoum is preferred in areas without non-target species, while difenacoum is preferred in areas with non-target species. It is worth noting that both mice and rats have developed resistance to brodifacoum and difenacoum, although the latter remains effective against mice. As such uses of such ingredients is likely to exert a selectionary pressure, with larger and larger proportions of the rodent population possessing resistance to poisons. This is why we recommend ultrasonic repellers – the only lasting solution to your rat problem. What type of bait should I use; grain, blocks or paste? Grain is the most common on the market and is easy to use by putting down around infested areas. Rodents will hold the bait in their cheeks and carry it back to the nest to feed others. Grain is generally effective due to being a part of a rodent’s natural diet. The difficulty with grain is preventing non-target species from ingesting the poison. Bait blocks are advantageous due to their ability to be secured in bait stations or to surfaced using wire. Activity is easily monitored due to bite marks in the grain. They can be easily stored and transported with minimal risk of leaks or spillage. An ideal form of treatment in areas where keeping treatment away from non-target species is a concern. Their wax content makes them ideal for use in damp conditions. The one drawback of block bait is that they may not be as palatable as other alternatives and therefore could take a little longer to be effective. Paste Sachets are highly attractive to rodents; made from ingredients such as cereals, oils, flour or fat and usually added flavouring. The packaging tends to be edible (like sugar paper). The sachet can be secured to a surface if required. Usually more powerful than traditional baits, they are mixed with liquid poisons to ensure every bite contains the active ingredient. They are particularly useful where rodents have refused to take other bait due to their attractive nature. The type of bait is of secondary importance to the active ingredient. Grain bait is preferred in areas without non-target animals, while bait blocks are preferred in areas with non-target animals as they are easily secured in bait stations. Paste sachets are best used as a last resort, as their strong attractants can attract non-target species. Where should I put the bait? For rats it’s important to identify areas of activity; faeces are usually a good indicator. Grain or Paste can be placed down burrows. Bait stations can be located along the runs between burrows and likely feeding points. Bait should be placed in areas of high activity, again faeces is usually a good indicator. If you are struggling to locate the areas, see our tracker dust and UV torch which can be used to track footprints. Why are the rats or mice refusing to take the bait? Rats can be wary of new objects in their surrounding, so it may just be that they’re not yet used to the bait station or bait being in their environment. Allow up to 2 weeks with the poison in place, after which you will need to move the bait to an area of higher activity. Unlike rats, mice are inquisitive and will explore any new objects in their surroundings. They will have no problem exploring a bait station or tray however if you find they aren’t attracted to the bait, you may find a more attractive type of bait could be used such as paste sachets. It is also good practice to move the station or tray each time you top it up, due to the inquisitive nature of mice this will actually entice them to explore. How do anticoagulant poisons work? Anticoagulant poisons work by preventing the liver from recycling Vitamin K. Vitamin K is essential to make the blood clotting agents which protect from too much bleeding. With enough exposure to anticoagulant internal bleeding occurs which kills the target species. What does the law state about mouse poison? Using brodifacoum is legal providing it’s put in a bait station. This helps protect both children and non-target animals. If you are to place stations in living areas, it is best to exclude pets to other parts of the house. Similarly, if a bait station is disturbed it is important to first search for a dead rodent, before letting children/pets in. With other poisons the greatest possible care should be taken to ensure non-target animals do not consume them. Unsecured poisons will leave you in trouble with the law. How have changes in the law affected mouse poison products? As of February 2018, EU law has slashed the maximum level of active ingredient from 0.005% to 0.003% for public use. Pack sizes have changed reducing bait blocks to a maximum 300g for rats and 150g for mice, with grain, pasta or pellet baits falling to 150g for rats and 100g for mice. This has originated from assessments showing that higher concentrations pose a risk to human health and the environment. Is there a more humane or non-lethal way to get rats and mice out of your home? We sell a range of electronic repellers which use ultrasonic and electromagnetic signals to deter rodents. Our best selling repeller comes with a money back guarantee and has 1800+ reviews. had mice on and off for years,but now have bedbugs!We need to get rid of mice quickly as bed bugs can feed blood from them. Please advise on the strongest poison i can get. I have no kids at home and no pets either. Just 2 adults going out of their minds. Taken couple of boards up, as mice not seeming to come from under the boards as we have sealed all skirtings etc. We really need some good advice. Been going on 12 months now. Thanks. We recommend alphachloralose poison for mice. It is worth noting that while poison will kill your existing mice, it won’t do anything to stop new rodents from entering your property. If you have no pets or kids, ultrasonic repellers are perfect as they function as a long term deterrent to rodents. If you decide to purchase both solutions, use the poison first and then install the repeller as poison can attract mice. Brodifacoum poison is effective against mice and rats, and is extremely potent. Next: Is Picking Wild Flowers Legal in the UK?